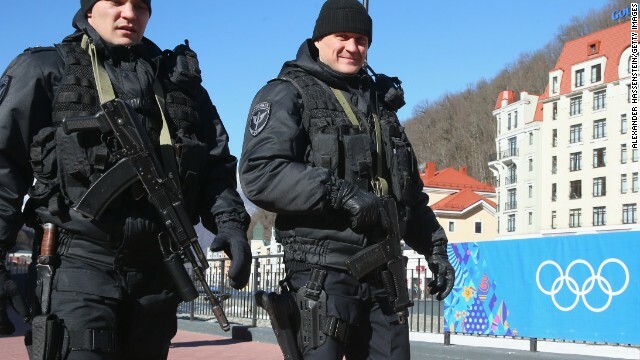 U.S. authorities are working with Russia and other countries to try to disrupt possible threats related to the Sochi Olympics, in addition to the toothpaste tube terror concern, a U.S. intelligence source said. The official said the threats varied in credibility. The biggest source of those threats is the group Imarat Kavkaz in Russia, which has publicly said it will try to disrupt the Games, the official said Thursday. 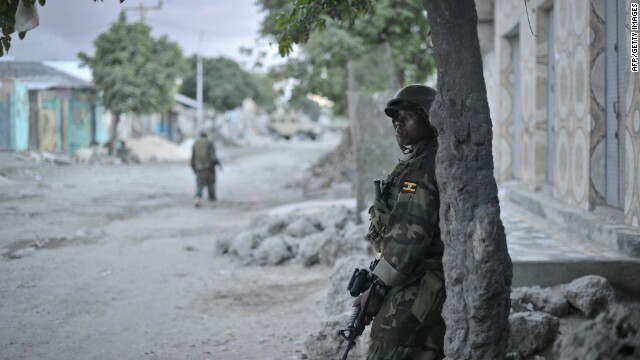 A soldier belonging to the African Union Mission in Somalia stands guard on a street during an operation aimed at improving security in Mogadishu, Somalia. Kenyan intelligence knows him simply as Ikrima. But his full name is Mohamed Abdikadir Mohamed, and he is regarded as one of the most dangerous commanders in the Somali terror group Al-Shabaab. U.S. officials say Ikrima was the target of a raid Saturday by U.S. Navy SEALs on an Al-Shabaab compound near the town of Baraawe in Somalia. It's believed that he escaped after the U.S. troops came under heavy fire. Ikrima is wanted by both the Kenyan government and its Western allies and was a close associate of one of al Qaeda's most important operatives in East Africa. A recent Kenyan intelligence report that was leaked just after the Westgate mall attack in Nairobi outlined several plots in which he was allegedly involved. All of them involved targets in Kenya, and all the attacks would have involved Kenyan citizens trained by Al-Shabaab. A file photo taken on September 30, 2004 shows Alleged Al-Qaeda militant Tunisia's Nizar Trabelsi arriving at the Brussels Palace of Justice to introduce a summary procedure against the Belgian State to protest his sentence. Alleged al Qaeda member extradited to U.S.
A Tunisian man who U.S. authorities allege is an al Qaeda member was extradited Thursday from Belgium to the United States to face charges stemming from a plot to bomb a NATO base there. Nizar Trabelsi, who was convicted in 2003 for that plot, spent 12 years in Belgian custody and was nearing the end of his sentence. The extradition could help resolve a major concern for U.S. and European terrorism officials who feared that because of shorter sentences in Belgium, Trabelsi could be freed. The same charges in the United States could carry a life sentence, if he is convicted. Trabelsi was arrested on September 13, 2001, in Belgium - two days after the 9/11 attacks - and charged with plotting to carry out a suicide bomb attack. Trabelsi was indicted in 2006 by a grand jury in Washington. The indictment was unsealed Thursday. The Al-Shabaab assault on a mall in Nairobi, Kenya, is alarming for its audacity, its scale and the sophisticated planning that went into it. Both the choice of target and method of attack exactly fit the new al Qaeda playbook. Few counterterrorism experts are surprised that the Somali group launched another attack in the Kenyan capital. It has threatened to take revenge ever since Kenyan forces entered Al-Shabaab's heartland in southern Somalia. Small-scale attacks, frequently with hand grenades, have already brought bloodshed to Nairobi's streets. Back in September of last year, Kenyan authorities said they had disrupted a major plot to attack public spaces in Nairobi in its final stages of planning. Authorities also broke up a plot by the group against Western tourists in the city in late 2007. 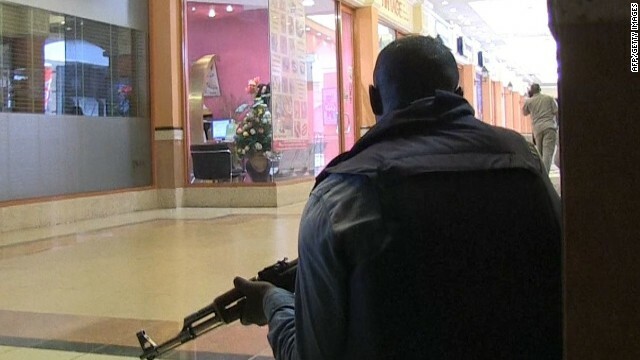 But the scope of the assault on the Westgate Mall - and especially its eerie similarities to the attack in Mumbai, India, in 2008 - show that Al-Shabaab has taken its ability to strike outside Somalia to a new level. Only once before has the group caused such carnage in East Africa, when bombers attacked bars and restaurants in the Ugandan capital, Kampala, on the night of the World Cup Final in 2010. More than 60 people were killed. Al-Shabaab said the attacks were in retaliation for Uganda's leading role in the African Union force supporting Somalia's weak government in Mogadishu. For al Qaeda leader Ayman al-Zawahiri, keeping a grip on a far-flung brand and staying relevant while avoiding a visit from a Hellfire missile or U.S. Navy Seals brings multiple challenges. For a start, his authority derives from his long stint as Osama bin Laden's deputy; he certainly lacks the Saudi's aura among jihadists. He has lost many of his management team to a remorseless drone campaign. Al Qaeda central doesn't have the money it did in the good old days before the U.S. Treasury started going after beneficiaries in the Gulf. And all the action nowadays is among the franchises in places like Yemen, Somalia and Libya. 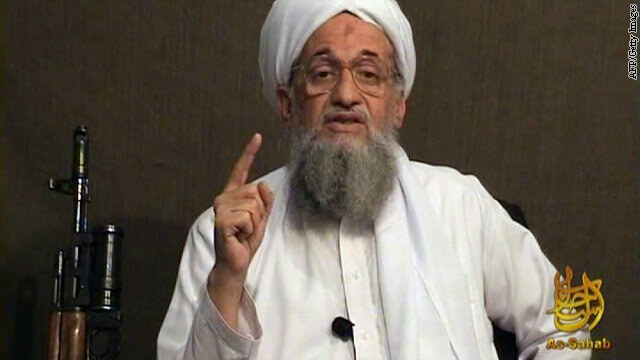 To put it kindly, Zawahiri is like the CEO of a company where local franchises do what they want. The revelation that al Qaeda leader Ayman al-Zawahiri has been communicating directly with the group's Yemeni franchise about future operations is causing plenty of consternation among western counter-terrorism officials. It suggests a heightened level of co-ordination between al Qaeda 'central' and its branches, and an initiative by Zawahiri to leverage instability in places far away from his hideout – thought to be somewhere along the Pakistan-Afghan border. There are still few confirmed specifics about the nature of the plot that Zawahiri was supposedly discussing with Nasir al-Wuhayshi, the leader of al Qaeda in the Arabian Peninsula (AQAP). But he has clearly identified that group as an effective affiliate, possibly the one best placed to attack U.S. interests directly. U.S. officials were concerned that a plot was timed to go into operation to coincide with the end of Ramadan, which has often been a period of increased terrorist activity. The Muslim holy month ends on Wednesday. In its upcoming issue, the al Qaeda-backed magazine Inspire praises the alleged Boston Marathon bombers as heroes and encourages readers in the United States to follow their example. According to an English copy of the magazine obtained by Flashpoint Partners, an American group tracking jihadist websites, the issue also has a section heralding the killing of a British soldier in London last week. The authors of the magazine, published by al Qaeda in the Arabian Peninsula based in Yemen, argue April's deadly violence in Boston proves that lone-wolf attacks can be effective in the United States. The issue also warns Americans that they're not safe against such "unstoppable" operations. 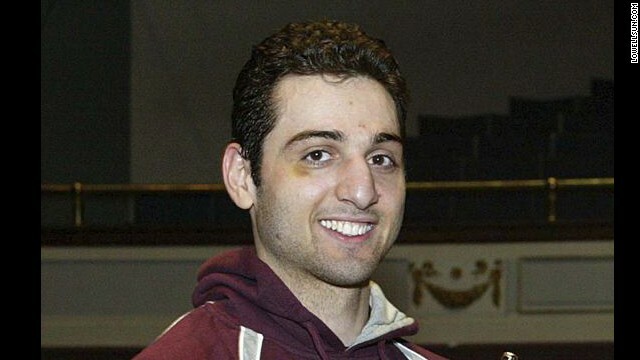 Tamerlan Tsarnaev appears to have become increasingly radical in ithe last three or four years, according to an analysis of his social media accounts and the accounts of family members. But there is so far no evidence of active association with international jihadist groups. In August 2012, soon after returning from a long visit to Russia, Tsarnaev created a YouTube channel with links to a number of videos. Two videos under a category labeled "Terrorists" were deleted. It's not clear when or by whom. But analysis by CNN and the SITE Intelligence Institute has uncovered a screen grab from one of those videos. It features members of the group Imarat Kavkaz - identifiable by the logo on their shirts. Imarat Kavkaz is the most potent militant Islamist group in Russia's North Caucasus region - which includes Chechnya and Dagestan. 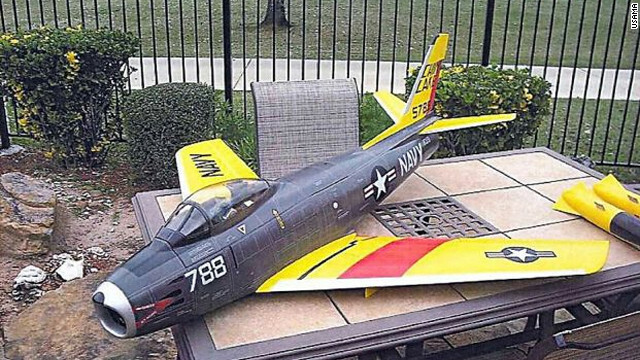 A remote controlled model of the US Navy's 1950s Sabre jet fighter that allegedly belonged to Rezwan Ferdaus. The video recovered by Spanish security services shows a man guiding a large remote-controlled plane in the skies of southern Spain. The plane banks and begins a controlled descent. Two packets drop - one from either wing - to the delight of the "pilot." According to Fernando Reinares, senior terrorism analyst at Madrid's Elcano Royal Institute, Spanish security services believe the video was made not by an enthusiastic hobbyist, but by a committed terrorist trying to convert a toy plane into a potentially deadly bomber. The home video was recovered last week, along with explosives, in what Spanish authorities called one of the most significant operations against al Qaeda in the country. Editor's note: This report is based on a one-year investigation by CNN into air cargo security in light of a thwarted plot by al Qaeda in October 2010 to blow up cargo jets over the United States. CNN's Nic Robertson's report "Deadly Cargo" airs on CNN Presents, Saturday and Sunday February 18, 19 at 8 p.m. ET. In late October 2010 al Qaeda in the Arabian Penisula (AQAP) dropped off two “printer bombs” at UPS and FedEx offices in Yemen addressed to the United States.